The Venetian canals and their gondolas provide one of the world's most romantic experiences. It's clearly the gondola. 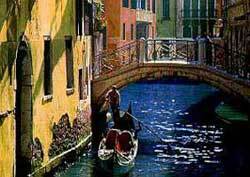 Imagine gliding slowly down the narrow canals in a gondola on a moonlit night to musical accompaniment. This is the broad, 3-kilometer (2-mile) long main water thoroughfare. The Grand Canal is lined with luxurious centuries-old palazzos with ornate Renaissance-style facades - and is spanned by the elaborately designed Rialto Bridge. The 150 canals of Venice are its streets - roads for land passenger vehicles are nonexistent. Everyone must travel by foot or boat, tourists and locals alike. The chief and often the fastest means of transportation is the foot - thanks to the 400 pedestrian bridges that link Venice's many small islands. When distance is far, locals use the vaporetto (water bus) or the swift but expensive water taxi. Although Venetians once used gondolas extensively, they now leave this man-powered vessel for the tourists. They date back to the 5th century when regional inhabitants built nascent Venice in a swampy, sparsely settled lagoon in order to escape the swords of the invading Barbarians.